SINGAPORE - A new travel index has named Singapore as the world's most welcoming city, with the Republic earning high marks for its safety, world-class airport and willingness to host tourists. It pipped the likes of Sweden's Stockholm, San Francisco in the US, Japan's capital Tokyo and Switzerland's Zurich to top spot. Bottom-ranked cities included Russia's Moscow, Vietnam's Hanoi and Hungary's Budapest. The index, published on Oct 31 by holiday website TravelBird, ranked a total of 100 cities across the globe, according to factors such as expert opinion, port of entry, safety, happiness, English proficiency and openness to accommodating tourists. 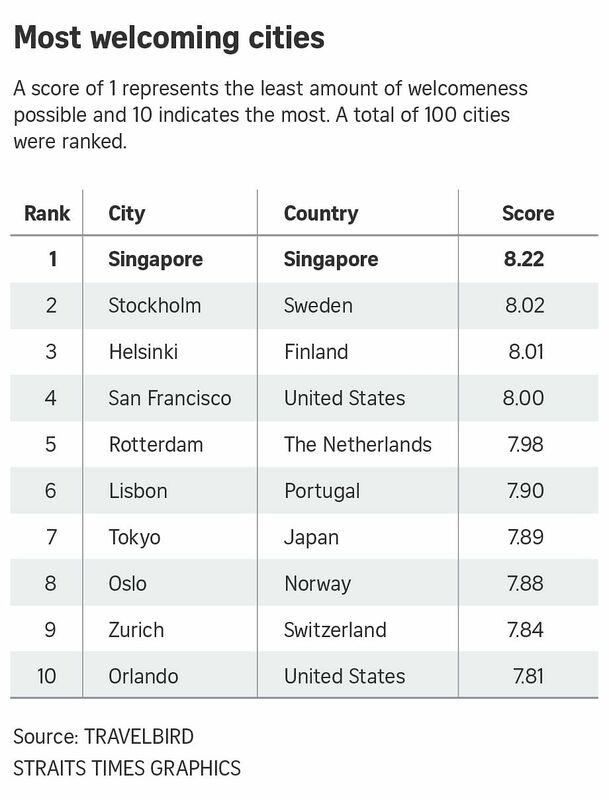 Singapore earned a perfect score of 10 for port of entry, while the index also gave the country high scores for safety (8.95) and openness to host tourists at home (8.6). It earned an overall score of 8.22, with Stockholm (8.02), Helsinki (8.01), San Francisco (8) and Rotterdam (7.98) rounding out the top five spots. Thousands of cities were first examined - based on data from the World Tourism Organisation - before the index focused on the top 500 destinations according to tourist arrival numbers. An expert poll conducted with more than 15,000 travel journalists, asking them how welcoming they found each city based on their personal experiences, was also taken into consideration. The Telegraph reported that the index, which was released to coincide with the United Nations' World Cities Day, was inspired by the anti-tourism backlash seen in some of Europe's most popular cities such as Barcelona and Venice. Cities deemed to have suffered from overtourism were marked down. Such cities struggle with the impact that having too many tourists has on the local population and the environment, and have taken steps to limit their numbers in recent years. Said TravelBird chief executive Steven Klooster: "We devised this study as the first step towards a more sustainable future. It's a call to action to ourselves and to fellow tour operators, to residents and local governments in those places that are worst affected by overtourism, to work together to find solutions to this problem."